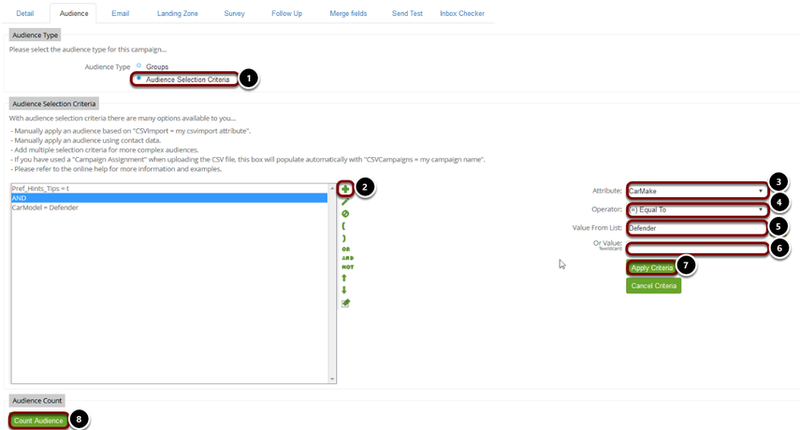 The audience tab within the campaign is where you attach the audience you wish to send to. To attach a Group to the campaign select groups. Select the group by choosing from the dropdown list or by clicking select. Once the group is attached click 'Count Audience' to ensure the count is correct. Within the campaign selection criteria you are able to build an audience to send your campaign to from within the campaign. If you tend to build a different audience based upon contact criteria that you have stored within GatorMail each time you send, then this is a particularly good method as you will not end up with hundreds of redundant groups stored within GatorMail. Click the Add Criteria icon. Select the attribute you wish to filter your audience members by. Select an operator from the list, in this example we have chosen 'Equal to' as we are looking for an exact match. You can select from a list of existing values stored against existing contact records. Click Apply Criteria, you may also cancel at this stage. Count the audience once you have applied the criteria to ensure that it is correct. Please Note: It is possible to apply multiple conditions using the 'AND' and 'OR' command. This is the total count of the audience attached. 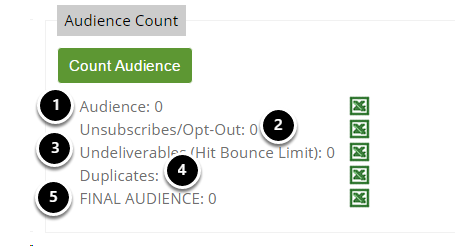 This is the number of contacts in the audience that will not be sent to as they have been suppressed due to having hit the bounce limit. (These contacts will have previously Hard Bounced or have Soft Bounced 5 times). This is the number of contacts that will not be sent to as they have been suppressed due to being marked as opted out, according to the Unsubscribe attached to the Campaign. This is the number of duplicate contacts in your audience. This is the final number of contacts that will be sent the campaign. Please Note: the final audience count does not remove duplicates, these are done immediately before the send if the feature is enabled on your account. It also does not take into account any suppressions made under the 'Suppress Domain' section. These are done immediately before the send. Clicking on the green excel icon next to each count will export a list of contacts that are included in that count.